I’m Aussie. And I’m a cricket fan. So yes, right now I’m pretty happy with our boys! How long that happiness will last though, now that the team are winners, is a point of great doubt. For me, the joy of the emphatic 5-0 success in the Ashes series comes mostly from knowing how low the team has been within the last twelve months. I became a more-than-casual cricket fan somewhere between the Aussie team being on the other end of an Indian Test series whitewash less than a year ago, and failing to regain the Ashes in July/August with England’s 3-0 victory on home soil. The underdog has often found a fan in me. 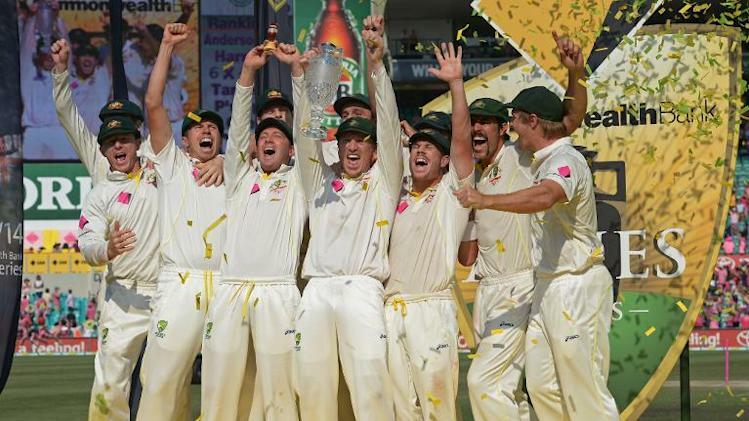 It’s near impossible to have seen Australia as anything other than that in the world of Test cricket last June. The prediction by some of a 10-0 drubbing over the course of the back-to-back Ashes series probably piqued my interest more than anything else. Then Ashton Agar’s extraordinary debut innings of 98 with the bat at number 11 in the first innings of the Test at Trent Bridge happened, and it had two instant effects: it kindled the fire of hope and resurrection for the team, as I saw the impact one unexpected performance could make on a match and on a team; and it completely tipped me over the edge to becoming a die hard fan! By the end of the first series I was confident – as were many – that the Australian team was better than the final Ashes score line suggested. I knew their time would come. In August, I booked tickets to the Boxing Day Test at the MCG. And waited. And watched. Such was my crazed new interested in the game, I even went to watch a couple of Sheffield Shield games at the MCG in October and November – sharing the experience with only a few hundred at a time in that massive coliseum. A somewhat surreal experience! To be fair, at one of those matches – Vic vs NSW – I was seeing more than half the Aussie team in action anyway. I even managed to grab a photo with Michael Clarke as he obliged the small crowd of fans between balls whilst fielding in the outfield. So by the start of the 2013-14 Ashes series my anticipation for an improved Australian performance had heightened out of control. You can probably imagine my horror then at Australia’s day one top order batting collapse at the Gabba test. Haddin’s heroics and Mitch’s mastery saved the day somewhat, but it wasn’t looking great. Then something extraordinary happened – England’s whole batting line-up collapsed in even more spectacular fashion. And Mitch the Mo had arrived! Australia rallied, and apart from recurrent worrying moments when batting in the first innings of each subsequent Test, they haven’t looked back. It’s been Ashes fever for me ever since. Right now, I’m trying to work out whether I can really get just as excited about one day internationals, but so far only the ridiculously edge of your seat final seven overs of the Gabba ODI between Australia and England - and Faulkners fabulousness - has inspired the same level of passion. However I fear that while the winning is good for now, if it carries on this way there’s a great risk I’m going to get a bit bored. The years of dominance of the Australian team through the nineties and naughties barely registered with me – what’s the fun if there’s no competition? No surprise then that I’m seriously looking forward to next months Test series against South Africa across the ditch to the west. This will be a serious challenge for the Aussie team - just the sort of thing to spur me on. No surprise either that I’m actually glad Australia still seems to have a problem with its top order when it comes to batting - something to work on, some point of doubt, is good as far as I’m concerned. So bring it on Proteas! Let’s see just how good this Aussie team actually is. A little part of me is hoping they get a big shock.